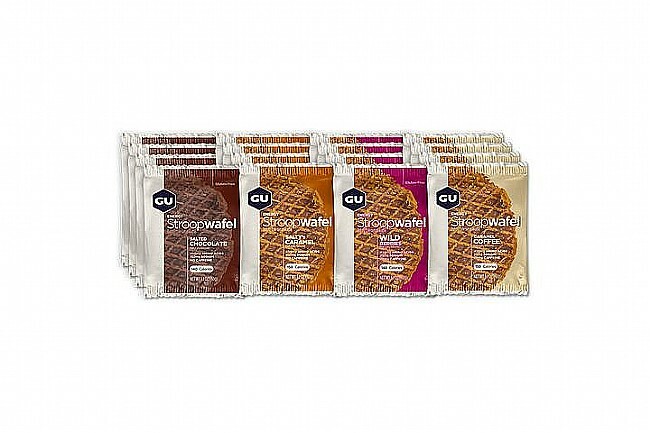 GU’s Stroopwafel (Mixed Box of 16) contains 16 individually packaged stroopwafels -- for easy on-the-go fueling -- each containing complex and simple carbohydrates, essential amino acids, and electrolytes. Consume Stroopwafels before or during training and competition to boost and sustain performance. Complex and simple carbohydrates deliver immediate and long-lasting energy; essential amino acids stave off mental fatigue and repair muscle damage, which is especially important for long-duration activities; electrolytes help maintain the body’s fluid balance, prevent dehydration, and deter muscle cramping. All flavors are certified Kosher. Most flavors are Gluten Free. Caramel Coffee and Salty's Caramel are NOT Gluten Free. I had some Honey Stinger Waffles from a couple of registered bike tours and like it. Thus I want to try a sample pack of waffles from GU. They taste great but are not filling like a Clif Bar. If your stomach is growling on a ride, you will need to eat several waffles to curb your hunger.